Known for their excellent quality, value and performance, this 20A HV SBEC by YEP is a must have for any model where clean, reliable power for your electronics is required. 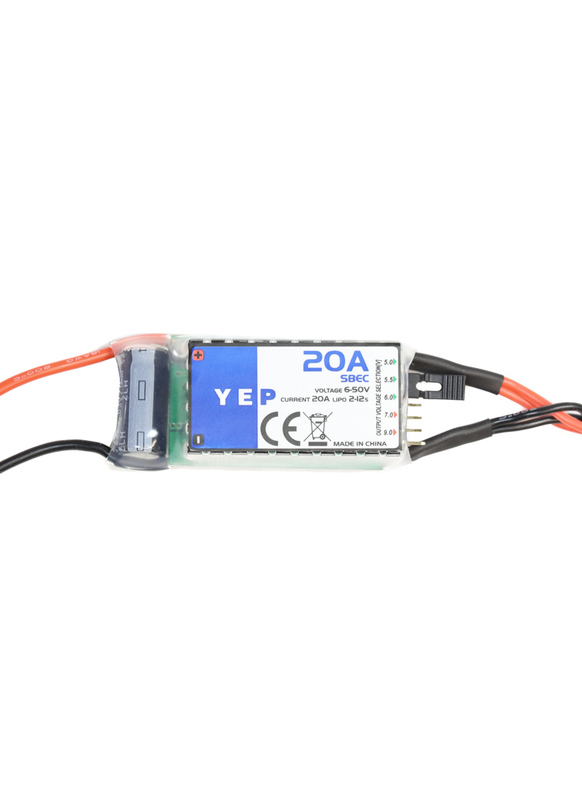 Offering a wide input voltage range of 6~50V, the YEP 20A SBEC can be used with just about any application from small models all the way up to 800 size helis or large gas airplanes. The voltage output is selectable by jumper for 5V, 5.5V, 6V, 7V or 9V operation. Additionally, this unit features dual output leads which not only provides power redundancy, it also spreads the current load over two sets of leads to ensure you are not putting too many Amps through one lead.